This post is long overdue. Several weeks ago, I received an invitation to attend a bloggers meet-sponsored by Kickers. I had not heard of the brand as I have lived most of my life in the States. Most people I spoke with in the UK said they had memories of wearing the brand as children. I did not know what to expect. When I arrived, they were serving colorful mixed drinks and tasty finger foods. The show kicked off with this user generated video, a remix of Chromeo's Fancy Footwork. Kinda cool. Then their young designer showed us an illustration he did of the Kickers World, which was amazingly detailed. It was a 3ft X 3ft pen drawing illustrating the Kickers brand. Check out some of the images. At the end of the event, Hugh Sweeny, Marketing Manager for Kickers announce that all the bloggers that attended will be receiving a free pair of kickers. Our sizes were taken and we were promise a White shoe with elements of the Kickers World drawing as the design. I'd say it was a good introduction to the brand. It was a good to experience a nice little blogger outreach campaign. In an effort to keep busy and to highlight my interest in new media, I created yet another blog. Our industry has so many cool elements and it's difficult to show interest in more than one area. I am taking the multiple story line approach to demonstrate a more rounded interest in marketing and innovation. Adcentered is a mixture of all things interesting, while Media Medium offers a unique media perspective. My role as the Media Medium is part futurist and part psychic. In this blog I make predictions about about the future of media. Some of the predictions are wishful, but I try to be honest and forward thinking in each post. Give it a look if you get a chance and tell me what you think. Last week I was invited to contribute to Beneath the Brand. BTB is a blog run by Talent Zoo, an online career site for marketing, advertising and PR talent. Talent Zoo is a great resource for agencies and creative professionals. Beneath the Brand features several contributors who write daily about the industry. 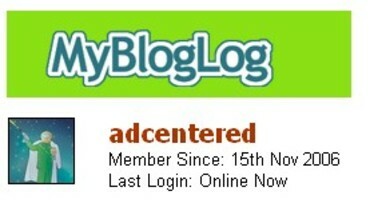 It is a great addition to the ad blog community. Add it to your blog roll if you like. You can catch some of my writing on BTB by clicking here. Congratulations You! The people that generate the content of the new information age are the winners. Everyone from bloggers to YouTube are winners. It appears that Time is giving much credit to Web 2.0 and everyone in it. I don't know how I feel about this. In a way I'm flattered, but it also feels like generic fortune cookie advice. I mean, I am only flattered because I am taking what they are telling me and applying it to my my life. 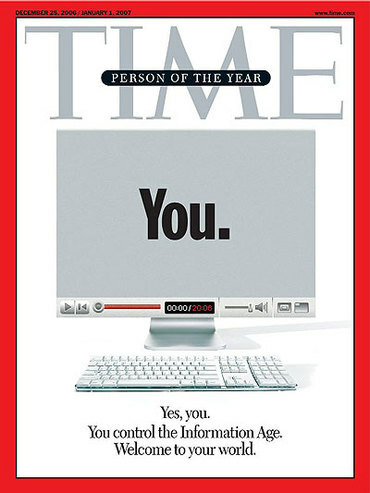 Are you not person of the year if you are on the B side of the digital divide? I'm left with more questions than answers. If Time's goal was to inspire thinking, than it worked. MyBlogLog.com is a place where bloggers can interact with other bloggers. I heard about this a few weeks ago and I signed up for it, not knowing what to expect. As it turns out, MyBlogLog is great. You can join communities and interact with people who blog about everything. You'd be amazed at the number of blogs there are. People blog about anything from cooking to Wall Street, from inventions to shoes, and even advertising. People who view your site can become members of your community. MyBlogLog is great for networking with others who share your interest enough to blog about it. It is also a place to publicize your blog to others. My hits per day have increased since I began actively using MyBlogLog. If you are new at this, there's even a blog for new bloggers. It's worth checking out. You can thank Thanit Chiraskamin from Thailand for this next one. I saw this on his blog, A Closet. He is also considering Adcenter for graduate studies. He has a great blog, check it out on regular basis. The Olympic mascots for Beijing 2008 are playful and represent an Olympic flame and four of China's favorite animals. 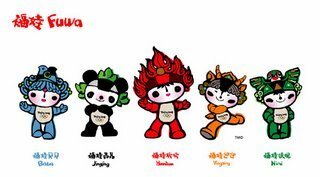 (fish, panda, swallow, & Tibetan antelope) They also represent millions of dollars worth of safe family friendly merchandising.